FC type gate valve has a non-rising stem with a slab gate, floating seat ring body bushing design to provide safe dependable services. 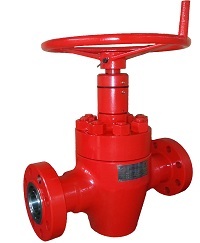 The standard features of FC gate valves include full-bore thru-conduit design and metal to metal seals between body and bonnet, gate and seat, and seat and body. The above features make it ideally suited for drilling manifold and production operations. Materials and trims are available for all operating conditions. It is available in flanged ends in standard bore sizes from 1-13/16" through 7-1/16" in working pressures from 2,000 psi to 20,000 psi. 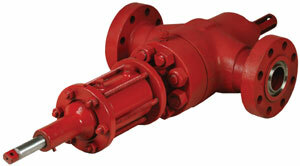 Ball Screw Operator is available for large bore and high pressure gate valves. All of our valves can be actuated by hydraulic or pneumatic actuators.